詳細 : THIS PROPERTY IS A MUST SEE!! 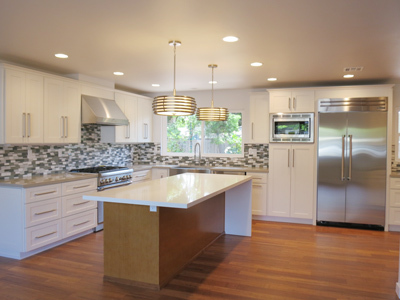 Perfectly remodeled 4 bedroom home nestled in a quiet cul-de-sac lot in Newport Heights. Remodeled kitchen features a large island, apron sink, Quartz countertops, Thermador range, Thermador refrigerator, dishwasher, microwave, wine cooler and plenty of cabinet spaces. Kitchen opens up to the living room with a fireplace. Dual Master Bedroom. All 4 bedrooms and 4 bathrooms were remodeled. Two bedrooms come with barnyard closet doors! Attached three car garage has a brand new metal garage doors with openers. Front yard is easy-to-maintain landscape with no grass. Backyard has a built-in BBQ, fire pit, two fountains, and newly finished wood deck. Extensively remodeled with no expense spared! ALL NEW: bamboo flooring throughout the house, interior doors, light fixtures, exterior and interior paints, furnace, tankless water heater, 200 amp electrical panel and much more! There are too many upgrades to list. Close to excellent schools, shopping center, and great restaurants. Be first to live in this newly remodeled dream home! "Lovely Detached Patio Home in Irvine!" "Luxuriously Remodeled House in Newport Beach!" Brand New Water Front Property with Beach Access and Boat Slip!"